Building an Aero Precision m5 308 AR semi auto rifle and the magazine catch button too short? That’s because you need the proprietary Aero Precision M5 Extended Magazine Catch Button, or an Aero Precision M5 Lower Parts Kit. The Aero Precision lower parts kit includes the extended magazine catch button. So you have that brand new Aero Precision M5 308 AR lower or perhaps even another brand and you notice the magazine catch button is literally hanging by a thread or two after assembling. 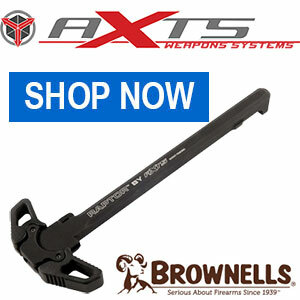 Aero has solved this with a $5 part (that Brownells should also offer). That part is Aero Precision Product Sku: APRH308185 Aero Precision M5 Extended Magazine Catch Button. Aero Precision M5 Extended Magazine Catch Button -The Extended Magazine Catch Button is a drop in replacement for the standard lower receiver magazine catch button. This extended button is longer, allowing it to protrude the proper distance when used with our M5 Lower Receiver. Aero Precision M5 Extended Magazine Catch Button solves the “magazine catch is too short” problem builders experience when assembling an Aero Precision M5/308 AR lower receiver.